If you want to cut the cost of a new kitchen, you might decide to take on the challenge of installing a new kitchen yourself. 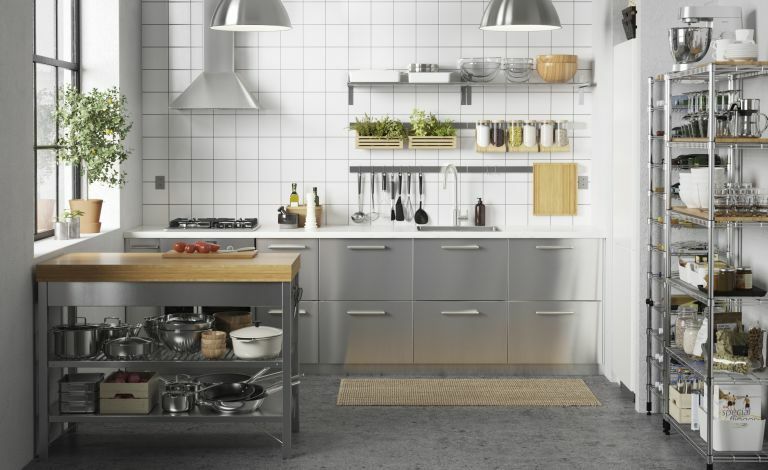 Here's how to fit a kitchen successfully. How much does it cost to fit a kitchen? Kitchen fitting costs really add to the overal spend on a new kitchen. Fit your own kitchen and you could save between £1,000 and £5,000* on the cost of employing a professional fitter, depending on the size of your room and the complexity of the design. Fitting your own kitchen is a brilliant way to save on your budget, especially if it is part of a larger kitchen redesign or kitchen extension. Before you start, make sure you’ve removed all the old units, disconnected the power and waste, levelled and tiled the floor, and plastered the walls. You might also want to put at least one coat of paint on the walls. Find out which paint to choose for kitchen walls. The standard height of base units is 91cm, with 15cm for plinths, 72cm for wall units and 4cm for worktops. Base units are usually 60cm deep and have widths that are multiples of 10cm or 15cm. Wall-mounted units are usually 30cm deep. Using a spirit level, measuring tape and pencil, mark on the walls where the top of the base units will be, remembering to allow for the legs, which may be adjustable. Move the base units into place, starting in a corner. Adjust the base units until the height aligns with the mark on the wall. Then, check that all of the units are level. Now you need to join the units to one another. The units are usually clamped and then screwed together through holes that will eventually be hidden under door hinges. Unless you’re using a specific corner unit, you’ll need to use corner posts to avoid gaps. Next, use brackets to fix the base units to the wall. If you’re attaching the units to masonry, you will need to use wall plugs, otherwise you can use plasterboard fixings. When you’re ready to move on to the wall units, use your spirit level, measuring tape and pencil to mark a horizontal line on the wall where the bottom of the units will sit. Allow at least 40cm of clearance between the worktop and the bottom the wall units. You then need to fix wall brackets to attach the units to, with most units needing two — one in each top corner. Once the brackets are fixed, you can hook the units on and make sure they’re level. Repeat step three to attached the wall units to one another. Screw on the doors and door fronts, along with any kickboards or plinths you are using. Finally, it’s time to fit the worktop. Laminate versions are easy to cut and fit yourself, and will come with laminate strips to cover edges. Timber, stone and composite worktops are better left in the hands of the professionals.